Even if you’ve checked out my articles on repairing broken horse halters, sometimes a halter is just beyond repair. 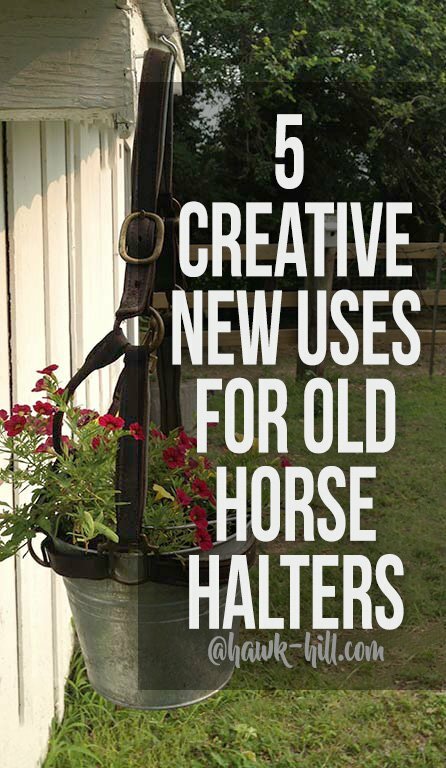 Whether it’s terminally broken or just too worn to be safely used, below I’ve collected a few great ideas on how to reuse, repurpose, and recycle horse halters. 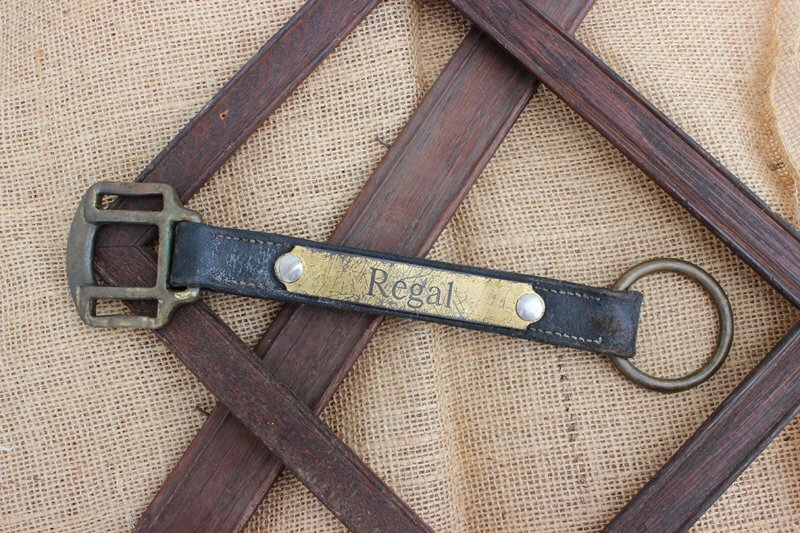 These re-purposing projects are a great excuse to buy quality leather halters for your horse. Nylon halters are colorful and economical, but wear quickly and wind up in the trash much sooner than a quality leather halters. Once broken in and “authentic”, leather halters are great for repurposing, and always have a vintage look- especially when paired with a distressed brass engraved plate. Using the cheek pieces of a halter and 2 crowns (or 2 rolled throatlatches) – Make your own tote bag personalized for your horse. This project could be completed using a hole punch and chicago screws to attach the handles to the cheek piece without needing riveting tools. The cheek could be attached to the bag via glue, or for heavy duty use, with an awl and thick waxed cotton thread. Like most horse farms, the supply of broken or just worn out halters seems endless at Hawk Hill. 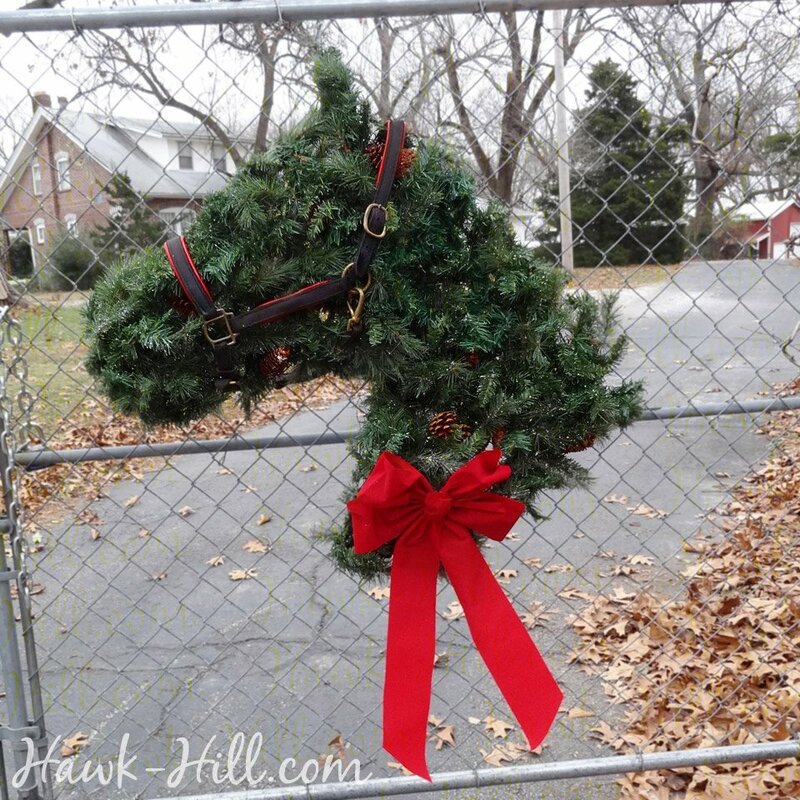 One year I used old halters, too worn to be used, for the horse head shaped wreaths adorning Hawk Hill’s gates during the Christmas Season. A bit of acrylic paint turned the previously blue-padded leather halters into red-padded halters that were a perfect compliment to the season. In recent years designers like Ralph Lauren and even Target have featured glass hurricanes with faux-equestrian leather detailing. All you need to make your own from a broken leather halter is a plain hurricane, a hole punch, and a package of Chicago screws (Chicago screws are rivets which attach with a screwdriver instead of requiring rivet setting tools). You can find extra hardware like buckles and O rings at twistednotions.com. A very heavy duty glue and lightweight clamps (even binder clips) to hold glued pieces together as they dried might be enough to complete this project. When the halter is a particularly sentimental reminder of a beloved old friend, It may feel more appropriate to feature it than repurpose it. Engraved halter cheeks look great framed on their own, or displayed as a collection. 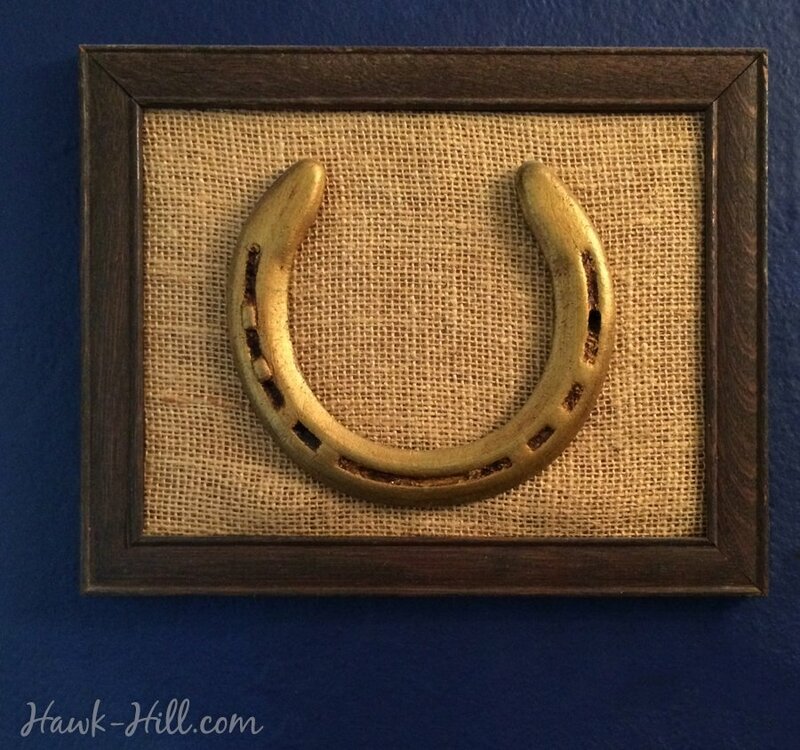 I’ve prepared a step by step tutorial to help you frame and mount old engraved halter cheeks and horse shoes. These framed items look artistic and, at least in my home, always invite comments. 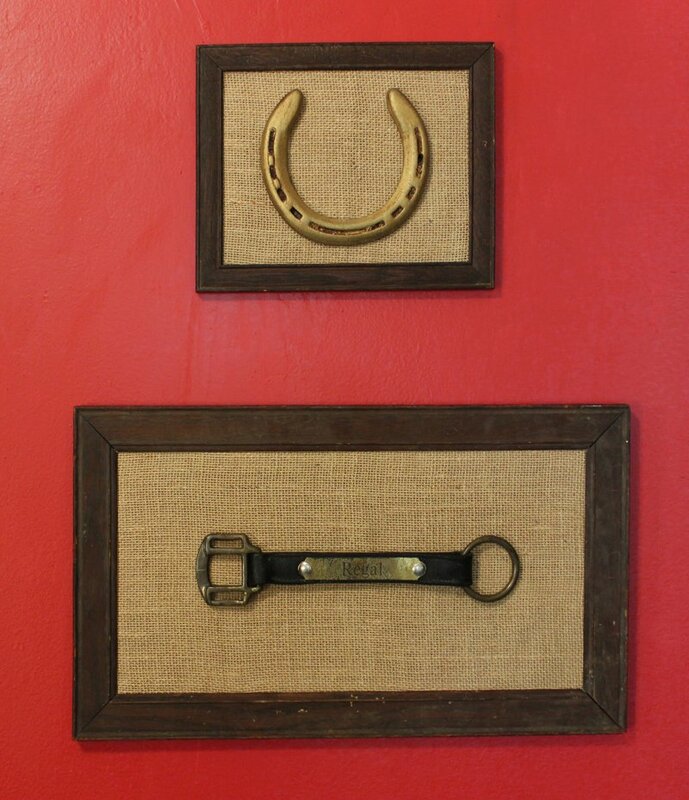 In stables I often see walls of photos of old horses, but if I ran a large horse farm I think it would be fun to create a gallery wall in a tack room or arena viewing room that featured horse shoes and halter plates from horses past, in an assortment of interesting frames and backgrounds. 1. Find a frame appropriately sized, remove the glass and wrap the existing image with canvas or burlap, then reassemble frame. 2. Cut the cheek piece from your halter, keeping the halter square and o ring attached. 3. Use an awl to pierce the cardboard backing and then use wire to secure your cheek piece in place. 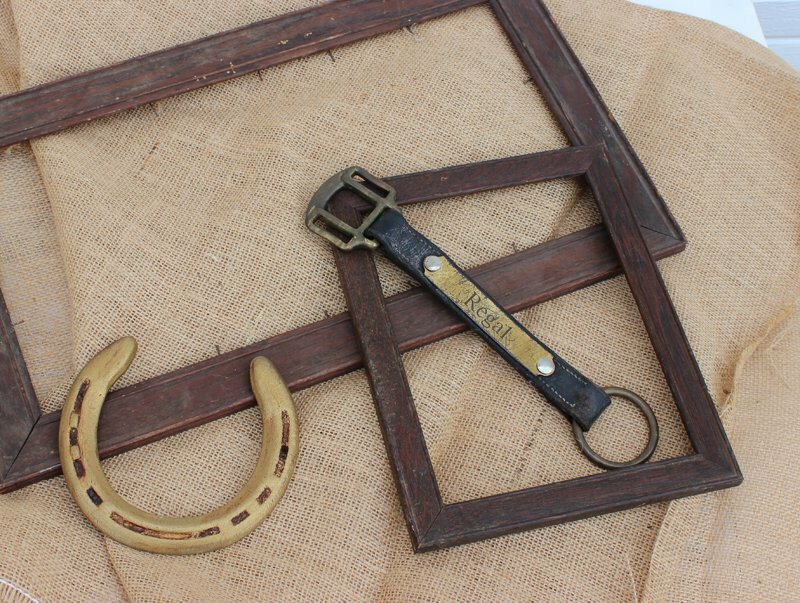 Framing the engraved section from a broken halter is easy- you just need frame, burlap, cardboard, and clear fishing line. Check out my tutorial for instructions! 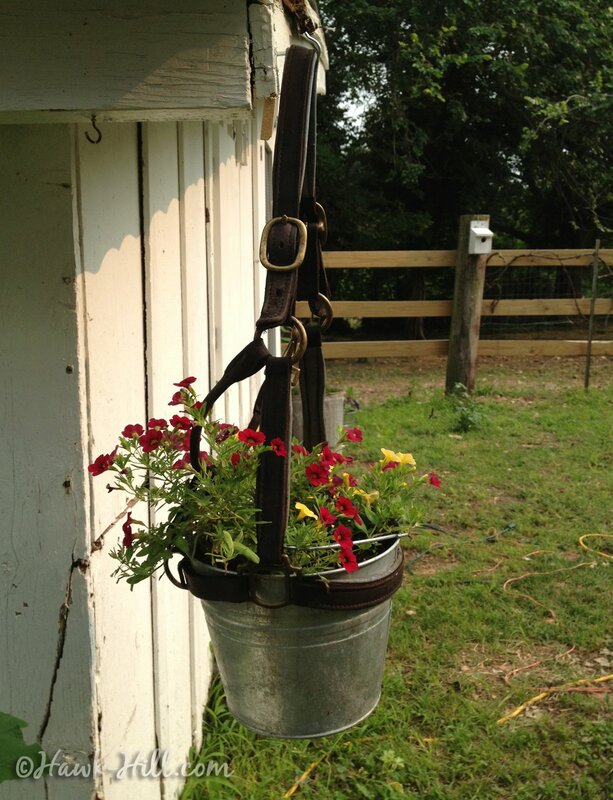 The noseband of an old halter makes a perfect holder for a tapered flower pot or small galvanized bucket of flowers. In this image from Hawk Hill, a small galvanized pail from the feed store fits perfectly into the noseband of a padded leather halter to brighten up my chicken coop. See the tutorial for making a this planter. 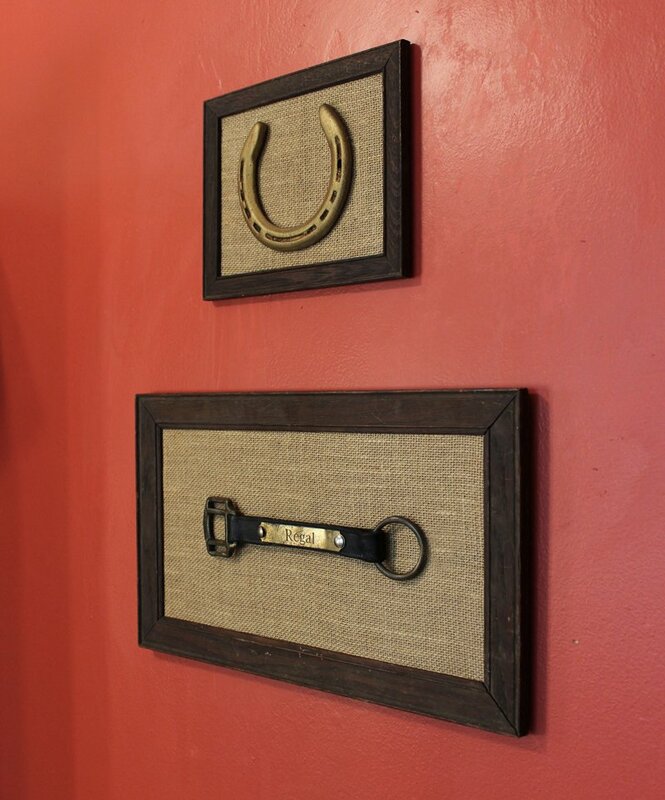 Do you have suggestions for creative ways to reuse and repurpose old halters? Leave a comment below- I’d love to partner up and feature your project!